Lyon BF are guaranteed a top 4 position in the LFB regular season standing at the end of round 12 by beating Toulouse (61-43) in the webcast TV game of the week. The two teams shared 4th place coming into this game. So there was a lot of stake but unfortunately the match did not live up to expectation. You can watch the full game on the bottom of this page. The Toulouse Métropole team had taken an early morning flight for this game. For the first 27 minutes of the game they gave the impression that they were suffering from jet lag as nothing was going right for them. The last 13 minutes were much better but by then it was way too late. Lyon started the game well and dominated the first quarter (19-8) without putting on any pressure. However during the second quarter Lyon showed all the good sides of their game as they rolled over Toulouse 21-8 for a half-time lead (40-16). 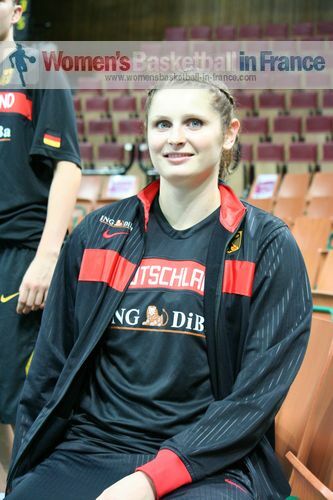 Romy Bär (in picture) was leading the way with 13 points with Lyon hitting 52% of their shots and also connecting 10-of-13 from the free-throw line. Toulouse on the other hand were shooting just 21% from the floor. Lyon lost their way during the third quarter and the match turned into a contest for the best miss for the following minutes. Both coaches were not amused and had some hard words to tell their teams during a time-out. When Lyon switched to zone, Toulouse started to score and reduced their deficit slightly going into the final quarter from 29 points to 21 points. The final quarter was more interesting to watch with some good plays from both sides. Yet the contest was already over. Mistie Mims and Bär finished the game with 16 points each while Mame-Marie Sy-Diop compiled a double-double of 11 points and 12 rebounds. For Toulouse, once again in front of the LFB TV cameras it was not to be. Demetress Adams did get into double digits with 10 points but otherwise this LFB match should quickly be forgotten.